Isn’t it funny how some family recipes are handed down from generation to generation and remain popular, with each family giving it their own particular tweak or twist? 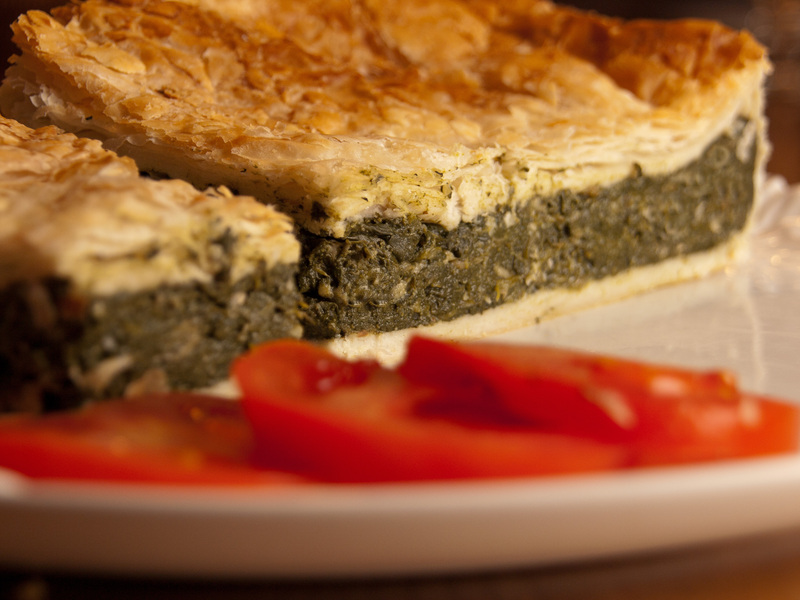 This spinach pie recipe was a favourite of mine when growing up and although it may have changed a little to when my mother and her mother made it, it’s essentially the same pie. I love the contrasting texture of crumbly puff pastry and soft, cheesy spinach with undertones of garlic. When I first started cooking it, my daughters were young and used to enjoy getting involved in the preparation. It’s not just eating but cooking that can be a sociable occasion and this is sort of recipe that can involve lots of helping hands. One to beat eggs, another to grate cheese and breadcrumbs, another to mix the whole lot in the big mixing bowl and to roll out the pastry. Then there’s always jam tarts to be made with the pastry trimmings for afters. This recipe, if made with fresh spinach and freshly grated cheese and breadcrumbs, will require you to set aside a couple of hours for preparation and cooking. So it’s best made when time is not of the essence, like weekends or for a special treat, which is what it was this Sunday following a request from my youngest daughter. She not only wanted to have some yummy home baked pie that evening but also wanted to take some back with her to university the following day. If pressed for time there are short cuts such as using frozen spinach and ready grated cheese and breadcrumbs but I prefer the “slow” way as the flavours are so much more intense. 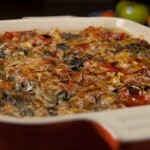 The pastry, eggs and cheese make this a filling meal so the quantities given below will feed between 8-10 people. Like pizza it’s perfect eaten on its own or with a light salad and the flavours will improve as it cools. Wash spinach and blanche* in a large pot of boiling water until the spinach wilts. Strain spinach to remove all excess water and chop roughly. Grate cheese and add to beaten eggs, breadcrumbs and crushed garlic. Mix spinach with rest of ingredients. Divide pastry into two 500g blocks and roll out. Butter a large oven proof dish and place one of the pastry layers in it. Add spinach mixture and cover with second layer of pastry. Trim any excess from sides. 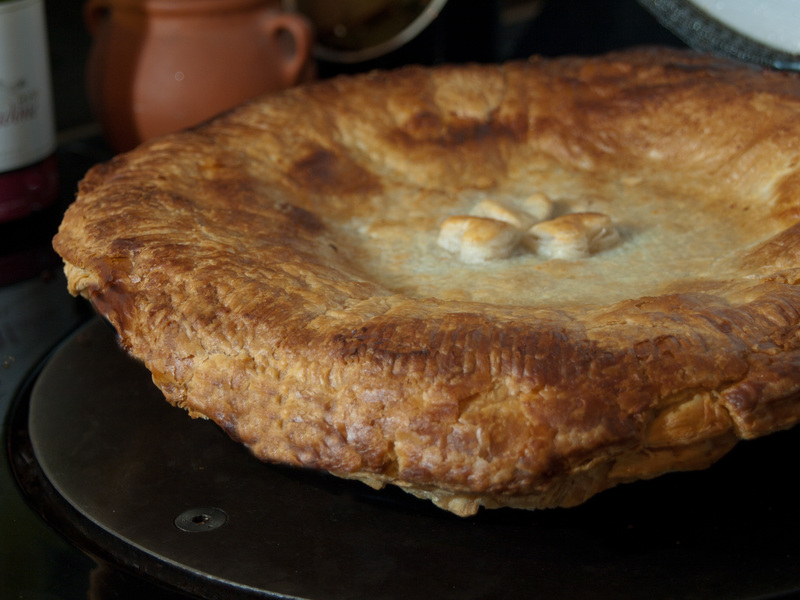 Use milk to seal pastry sides and to brush the top. Prick with fork before placing in pre-heated oven and baking at 200°C, Gas 7 for around 40 minutes or until the pastry turns golden brown. Chef’s Glossary: Blanching is a method of giving vegetables a quick dip in boiling water in order to soften them. In this recipe the spinach should be briefly submerged in the water until it wilts so as to enable it to be mixed easily with the rest of ingredients. You will need a large pan or else do this stage in smaller batches. It may look like a lot of spinach to start with but you will see how much it shrinks once it is blanched. use frozen spinach. 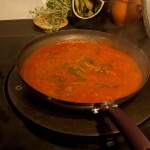 Defrost and remove excess water using a sieve before mixing in rest of ingredients. use pre-rolled pastry- but adjust quantities to around half given above as the pre-rolled rectangles are smaller. 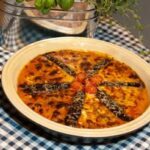 This entry was posted in All Recipes, Vegetarian and tagged cheese, eggs, family, garlic, Mediterranean diet, Pie, spinach by dontburntheonions. Bookmark the permalink.